If you are planning to purchase your first home, the challenge of finding the perfect one that fits your budget yet fulfils all your needs can be quite daunting. No matter whether you are purchasing a villa or an apartment, there are few things that you must keep in mind before making one of the biggest decisions in your life, i.e. buying a home. We have compiled some of the must-follow tips for the first time home buyers. Read on! 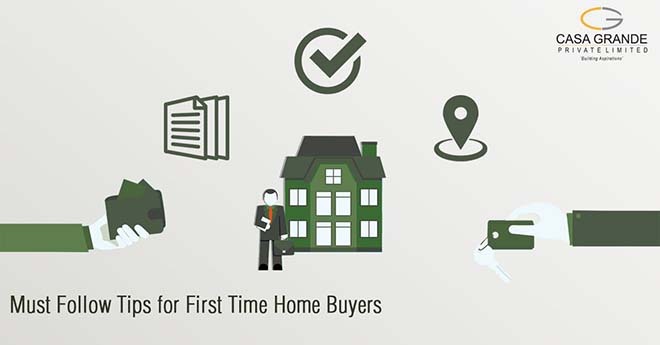 Mostly, first-time homebuyers purchase homes for their personal use. Therefore, the first thing that you must consider while buying a new home is to decide whether you want to live in an apartment, a villa, or a row house. While apartments and villas have their own pros and cons, it’s one’s personal choices that will make them decide which type of property they would like to buy. To know whether an apartment or a villa is the right choice for you, read this blog: Villas vs. Apartments: What’s your type? Another important criterion that one should consider while buying a home is the location. If you choose the right location, then your new home will be all the more convenient for you. A strategically located home should be close to hospitals, educational institutions, workplace, etc. It must also be well-connected to other localities and have great infrastructure. To know the best locations to buy your new home in Chennai, read this blog: Top Places in Chennai to buy your dream home. When you have decided to purchase a home, analyse on whether a ready-to-occupy home or a pre-launch property would be beneficial to you. While ready-to-occupy homes have benefits like tax savings, no waiting period, etc., pre-launch homes have discounted price benefits. Buying homes for the first time is a multi-dimensional investment. You need to consider various factors like comfort, security, location, social status, financial commitment, return on investment, etc. while deciding on the budget. Have a well thought out budget with a buffer of 10-20% as real estate property prices are bound to fluctuate. With the 2016 budget favouring homebuyers, now is the right time to invest in a home. Also, there are a lot of home loan options that are beneficial to homebuyers. An internal, personal aspect that you must consider while buying your first home is to think futuristic about your family’s needs. Families are bound to grow up steadily over a period. Therefore, while deciding on the size of the house you are investing in, it’s wise to ensure scalability options as well. Documentation of new property acquisition can be an elaborate process. When you buy homes from credible builders like Casagrand, the legal procedures will be completed in a hassle free manner. It can be quite overwhelming to deal with a lot of things like choosing a location, overseeing the construction, completing legal procedures, etc. To ease this process, you need to opt to buy your homes from a credible builder. Different builders will be good for different types of properties. Therefore, decide on the kind of property you want and then approach a builder. Alternatively, you can contact leading credible builders who are experienced in the real estate sector. Builders like Casagrand will be able to help you in deciding which property will suit your needs. We hope by now you have a clear idea about the things that you need to consider while investing in a house for the first time.